Students in the Dance department will perform 19 pieces Tuesday and Wednesday in Thunderground. When Grand Canyon University athletic training major Taylor White suddenly lost his life, it was a deep blow to the close-knit University that, even at more 20,000 students, still somehow feels like a small neighborhood of friends. That loss couldn’t have been felt more deeply than in GCU’s Dance department. White was just 21 when he was struck by a white SUV while jogging on a crosswalk with a friend on April 8, 2018, near 31st Avenue and Camelback Road. His fiancee, Sarah Tedeschi, an elementary education major, also studied dance. Her pain was the Dance department’s pain. They were quick to rally around her — and they’re still doing just that. 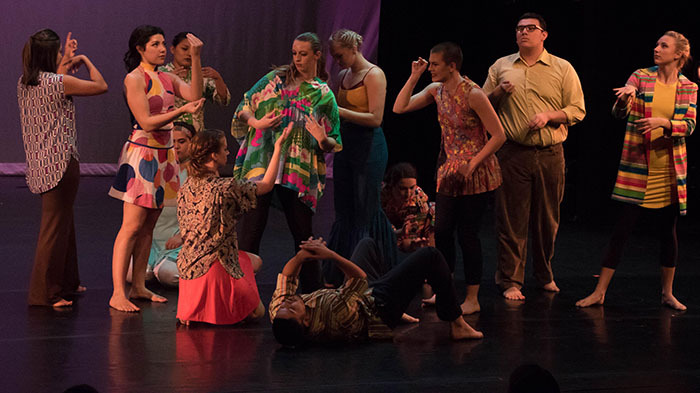 One of the pieces at the free-admission Dance Fall Student Spotlight, to be performed at 7:30 p.m. Tuesday and Wednesday at Thunder Alley in Thunderground, expresses the emotions of that loss and, with hope, looks for the dawn to break on the days that will continue to come. Madison Knutson choreographed the dance, “The Sun Will Rise and We Will, Too,” to the song “Away” by Heinali. It is one of 19 works to be performed at the concert, which features works by emerging student choreographers, from freshmen to seniors. It “presents works inspired by loss, friendship, change and the celebration of life,” according to the department. “The Sun Will Rise and We Will Too,” seems to encompass all of those themes. She said of the work, to be performed by Hannah Croft, Amanda Keller, Abigail Neighbors, Jessica Symmes and Chesney Thomason, that it’s “a beautiful piece; it’s not literal at all … it’s just beautiful” — a symbolic embodiment of all those emotions wrapped up in that experience. Keita said another interesting work in the show is “50607,” which she said delivers “astonishing synchronicity.” It is choreographed and performed by Julia Geringer and Anna Sanamyan to “Dedication” by MHBH. There’s the classical jazz piece “The Rhythm Section,” choreographed by Jessica Symmes to the dancey, rhythm overload of “Hip Hip Chin Cin” by Club des Belugas, along with a Latin ballroom duet called “VIVA!” choreographed by Elijah Figueroa to “Que Viva La Vida” by Wisin, and the “daft and quirky” “Consanguineal,” a work created by Justine Bach in collaboration with the dancers to “A Word Aptly Spoken” by Ray Barbee. And the work “Polymono Organization,” by Alyssa Quiett, features a cast of 20. Keita said student choreographers submit their pieces for adjudication by the faculty every semester. They get feedback from the faculty, then present the works again to show the progress of the pieces. What makes the student spotlight concerts so popular at GCU is that they’re a more casual presentation of dance, taking place in Thunderground, for one, rather than on the Ethington Theatre stage.